Try these Easy Caramel Sticky Buns for a sweet and gooey treat. 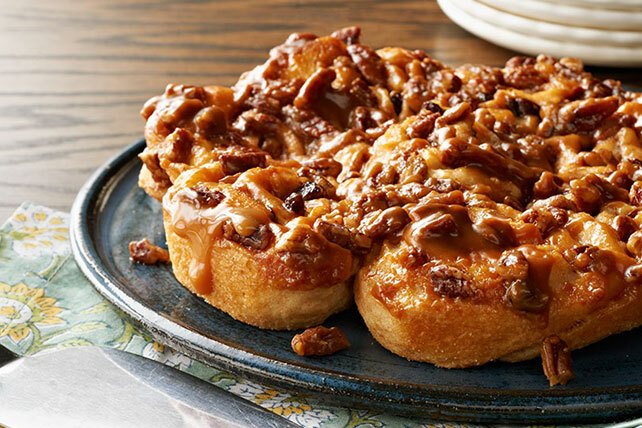 These caramel sticky buns are topped with sugar, cinnamon, pecans and raisins. Microwave caramels and milk in microwaveable bowl on HIGH 1-1/2 to 2 min. or until caramels are completely melted, stirring after each minute. Pour into 8-inch round pan sprayed with cooking spray; top with 1/2 cup nuts. Bake 17 to 20 min. or until lightly browned. Immediately invert pan onto plate; remove pan. Spread any caramel from pan over buns. Cool slightly. This sweet breakfast treat is a great addition to any brunch menu. Be sure to make enough so each person gets one bun. Substitute dried cranberries for the raisins.